One of the loveliest ways to wear handprint jewellery or footprint jewellery is on the Tiffany Style Hearts, so pretty and such a classic statement of a heart! Tiffany bill themselves as being America’s House of Design since 1837. Quite rightly so, I say! I have been asked to create a lot of handprint jewellery & footprint jewellery designs inspired by the classic jewellery makers, how could I resist a piece focussed on Tiffany?! And anyway, I love breakfast … So, here they are, beautiful silver hearts. 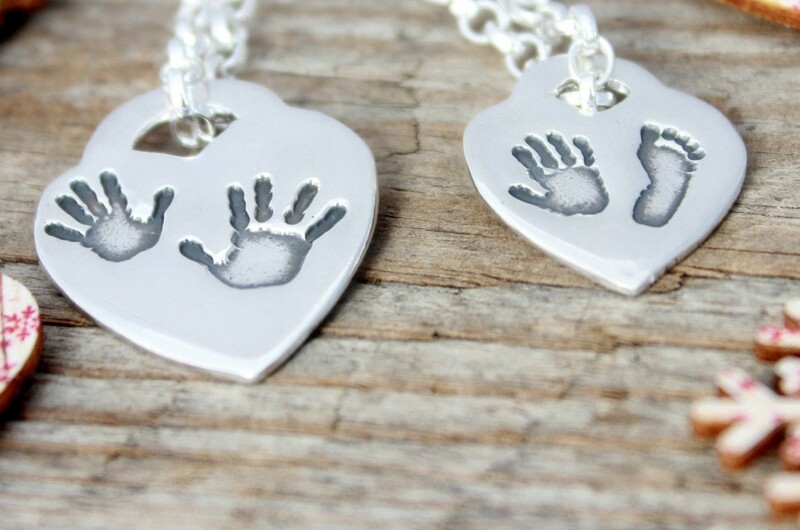 Of course you could also have fingerprints or paw prints on your silver hearts too if you wanted. And so these lovely little silver hearts were born for a lovely customer wanting a piece for her and her sister to wear on their Tiffany chains and alongside their Tiffany hearts. Perfect. Sometimes I love a new idea so much, it finds it’s way into the Impressions to Keep range, so these have quite rightly taken residence. I hope you like them!